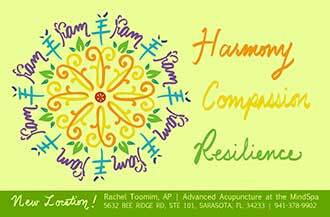 For over 20 years, acupuncturist Rachel Toomim has been recognized as a distinguished leader, scholar and a results-oriented practitioner. As acknowledgement of her advanced acupuncture techniques and leadership skills, she received the Chief Justice Commendation from the Supreme Court of Florida and was elected to three national acupuncture boards. She teaches throughout the country and served as faculty for the University of Miami’s School of Complementary & Alternative Medicine. Rachel Toomim A.P. is able to merge acupuncture theory with understandings from modern medicine to allow for better integration with treatment provided by your doctor and other practitioners. mobile site • Bradenton Website Maintenance by Noble Webworks, Inc.